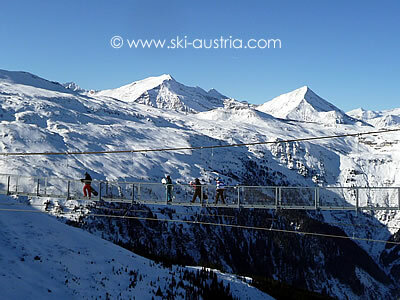 Bad Gastein is probably the best-known of the ski resorts in the Gastein valley. Its spectacular position and layout, the traditional spa hotels and the access to three different ski areas are all good reasons for that popularity. 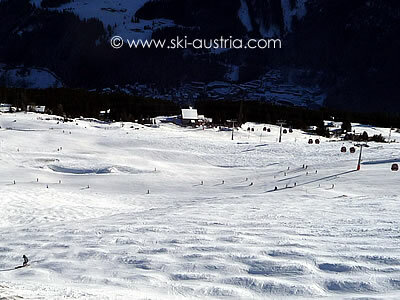 The areas of Sportgastein and Graukogel are covered on a separate page - this ski review only covers the western side of the valley and the connection with the Bad Hofgastein skiing. 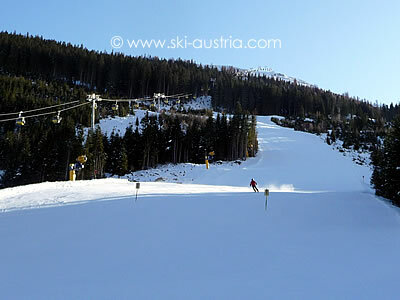 Bad Gastein's main ski area is on the "sunny" western side of the valley. 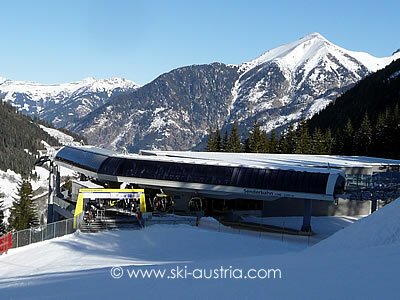 Access to the long intermediate slopes above the town is via the two stages of the Stubnerkogel gondola. Before even starting out on the ski slopes there is an opportunity to get the adrenaline pumping as the top gondola station is also the location of the photogenic "hanging bridge". This stretches across a fairly wide gully behind the gondola building with views down to the Jungeralm area below. The runs under the top gondola are fairly straightforward blue and red runs above the tree line. A juction to the left heads through to the top of the short Burgstall T-bar while there is a blue run stretching all the way back down to the town when open. The other runs heading away from the top Stubnerkogel gondola station in either direction lead down to the Angertal side of the mountain. The red run to the right exiting the gondola building traverses the ridge before heading down and joining the Jungeralm area. 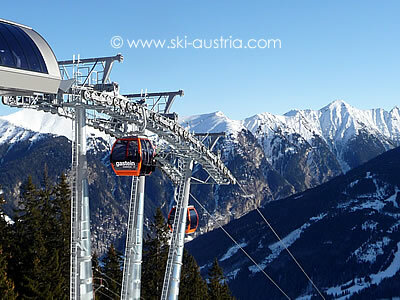 The Angertal base links either into the Bad Hofgastein ski area or accesses Bad Gastein again via the Senderbahn gondolas or the Angertal chairlift and the Burgstall drag lift. The live webcam stream below is taken from the Stubnerkogel. Other webcams showing the ski areas in the Upper Gastein valley are available by clicking the middle button above the live stream.